The increasing presence of toxic chemicals in our environment increases the risk of life-threatening challenges. 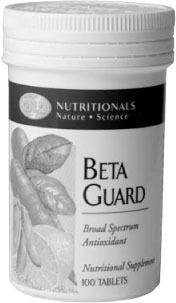 GNLD’s Beta Guard offers nutritional protection. Its synergistic blend of antioxidant and detoxifying nutrients helps the body neutralize and metabolize toxic materials. Why a nutritional supplement to protect against environmental toxins? Pollution threatens our well-being. The assault comes from all sides. The air we breathe, both indoors and out, as well as the water we drink and the food we eat are all potential sources of toxic exposure. Scientific research shows that certain nutrients may boost the body’s defences against environmental toxins, by interfering with toxic reactions and preventing cellular damage. Developed by world-renowned toxicologist Dr. Arthur Furst - formulated specifically to assist in defending the body against harmful agents in our air, water and food. Synergistic blend of both antioxidants and detoxifying nutrients to help the body interrupt toxic processes and protect against cellular damage from environmental pollutants. Provides antioxidant protection from beta-carotene and other carotenoids as they occur naturally in carrots, plus vitamin C and the complete vitamin E family of tocopherols and tocotrienols. Helps detoxify foreign substances which are ingested or inhaled. B vitamins, including niacin and pyridoxine, help detoxify foreign substances. Helps protect against heavy metal contamination and helps boost the defence system. Zinc, selenium and GTF chromium aid the body’s vital defences. Provides as much beta-carotene as two large carrots, plus whole-food-sourced vitamins C and E - to provide antioxidant protection against environmental pollutants. Contains B-vitamins, including niacin, and pyridoxine - to help the body detoxify foreign substances ingested or inhaled. Contains zinc and selenium - to defend against heavy metal poisons such as cadmium, mercury and lead. Contains GTF chromium and other active ingredients - to boost the defence system’s response and help the liver detoxify food additives such as artificial colourings. Amino-acid chelation - improves absorption of beneficial minerals. Formulated by one of the world’s leading toxicologists, Dr. Arthur Furst.